Zooby Prophy Paste features an optimal formulation of abrasives and adhesive properties designed for low splatter and great stain removal. Zooby paste contains xylitol and 1.23% fluoride! The Zooby Prophy Paste line includes six delicious gluten-free flavors available in fine, medium and coarse grits, which can be purchased separately or in an assortment pack. Zooby Prophy Paste Cup Grippers - 3 Pack® Every bag of paste contains a special auto- clavable Zooby Animal prophy paste gripper. Zooby® Prophy Paste Animal Grippers will hold your prophy paste cup during hygiene polishing procedures. 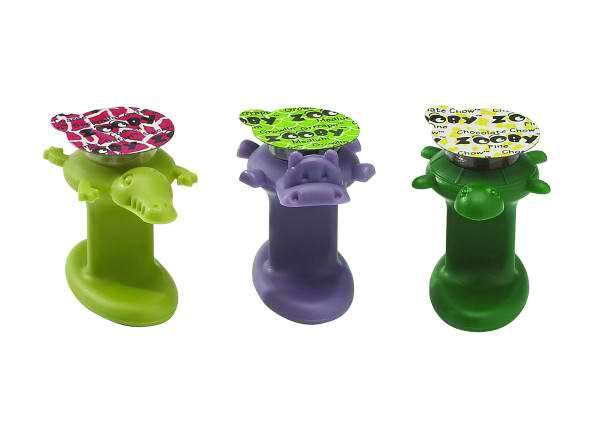 The grippers come in 3 different animal designs: Alligator, Hippo, and Turtle, and feature a wide base so they are easy to hold. They can even be autoclaved for repeated use! D-Lish prophy paste now has the de-licious flavors or the Fresh Strawberries, Dreamsicle Orange, Cocoa Mint, Berry Mint and Cinnamon Mint. These new mint flavors come in an assorted package called Mint Jubilee Assortment.